Thousands gathered in Montpelier Saturday for the Women's March on Montpelier, a "sister march" to the main gathering in Washington, D.C.
Marchers fill the Statehouse lawn Saturday in Montpelier. The events in Montpelier caused severe delays on I-89 midday Saturday, resulting in multiple ramps of the highway being temporarily shut down. Marchers fill the Statehouse lawn Saturday in Montpelier. The volume of people trying to get to the event caused Vermont State Police to close exit 8 off I-89 north and south Saturday. A sea of people gathered for the Women's March on Washington Saturday morning, including Vermonters who had traveled through the night by bus to participate. After a 13-hour bus ride, the D.C.-bound Vermonters arrive in Washington for the Women's March. Late Friday night, 55 people boarded a bus from Berlin, Vt., headed to the nation's capital, where they will participate in Saturday's Women's March on Washington. A "sister march" taking place in Montpelier Saturday is expected to attract thousands. Hundreds of thousands participated in the Women's March on Washington or in satellite marches across the country Saturday. Throughout the day, VPR will be with Vermonters participating in Washington, D.C., at what is expected to be the largest of the marches, as well at a "sister" event in Montpelier. VPR's Rebecca Sananes is traveling with a Vermont group headed to the march and will provide updates throughout the day. Follow reporter Rebecca Sananes for updates from the Women's March on Washington. While final estimates are still unavailable, Montpelier officials expected as many as 7,000 Saturday, for the Women's March and Unity Rally, held in solidarity with the Washington march. The event included remarks from Sen. Bernie Sanders, former Gov. Madeleine Kunin and 2016 gubernatorial candidate Sue Minter, as well as a performance by slam poetry group, Muslim Girls Making Change. Follow reporter Annie Russell for the latest from the Montpelier march. Follow VPR on Twitter, Facebook and Instagram for highlights from throughout the day. The estimate for the turnout at Montpelier's march now stands at 15,000. Read the full story from VPR's Annie Russell here. Saturday Jan. 21, 2017, 4:10 p.m.
Exit 8 is now open in both directions. Saturday Jan. 21, 2017, 3:45 p.m. According to the Vermont State Police, exit 7 is now open in both directions. Off ramps for exit 8 and 9 remain closed at this time. At the peak of the march, the Statehouse lawn was packed with marchers, many carrying signs and wearing pink hats. 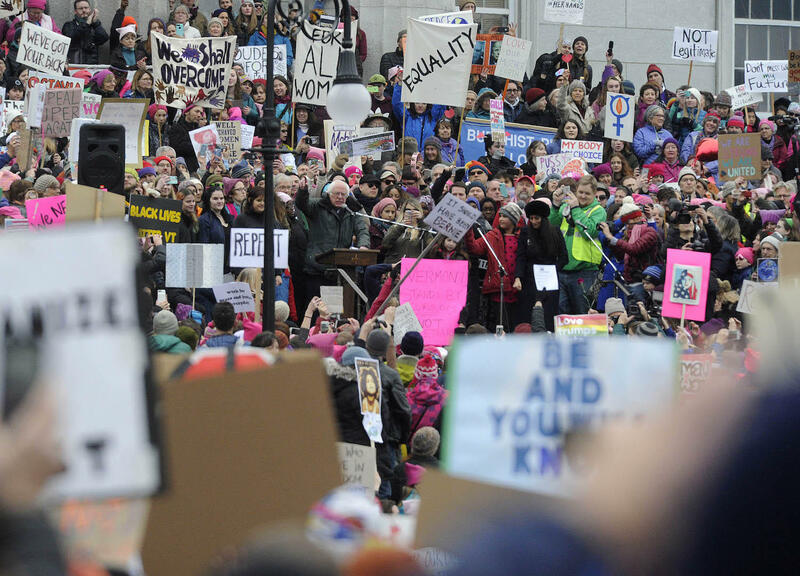 Sen. Bernie Sanders shared a message of solidarity with women during his remarks to the packed Statehouse lawn. Sen. Bernie Sanders during his remarks at the Women's March on Montpelier Saturday. Saturday Jan. 21, 2017, 3 p.m.
At this time, exit 7, 8 and 9 off ramps from I-89 are closed. On ramps at all three locations remain open. Saturday Jan. 21, 2017, 2 p.m. The Vermont State Police have announced they will be closing I-89 exit 9 (Middlesex) shortly, and exit 8 at Montpelier remains closed. "Traffic is backed up for miles both north and south bound in the travel and passing lanes in the area," police said. Montpelier City Police Chief Tony Facos says "travel within the city is highly restricted and city roads cannot support any more people or vehicles." Marchers packed the Statehouse lawn Saturday for the Women's March on Montpelier. While no official estimate has been released, city officials said they'd heard as many as 7,000 could in town for the event. Marchers raise fists in support of immigrants' rights at the Women's March on Montpelier Saturday. The slam poetry group known as Muslim Girls Making Change in front of the mic at Saturday's Women's March on Montpelier. Saturday Jan. 21, 2017, 1:30 p.m.
Just after 1 p.m. Saturday, the Vermont State Police closed Montpelier exit 8 on I-89 in both directions due to the congestion caused by motorists trying to make their way to Saturday's march in Montpelier. Commuters are advised at this time to seek alternative routes. Saturday Jan. 21, 2017, 12:30 p.m.
Vermont State Police say there are long backups north and south bound on I-89 near Montpelier due to today's events. They advise motorists to seek alternative routes or "use care and caution when approaching exit 8." The Women's March on Montpelier is expected to begin around 1 p.m. at Montpelier High School. In the nation's capital, the Women's March on Washington is well underway. VPR's Rebecca Sananes is with a group of Vermonters participating in the march and says spirits are high and "the energy is really positive" among those gathered. 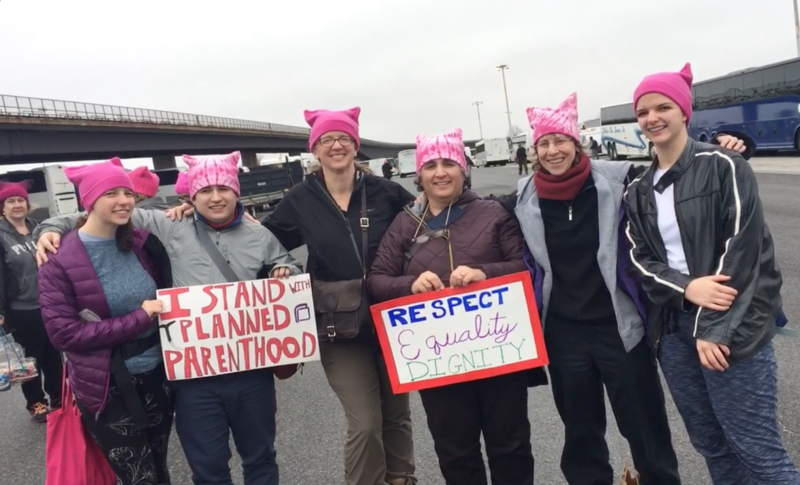 Saturday Jan. 21, 2017, 11 a.m.
After a 13-hour bus ride, the D.C.-bound Vermonters arrive in Washington with pink hats (or "pussyhats," as marchers are calling them) and signs in hand, ready for the Women's March. Saturday Jan. 21, 2017, 9:30 a.m.
Having traveled over 530 miles through the night, eager passengers on the Washington-bound bus begin to ready themselves for the march as they pass through Maryland. Traffic into the nation's capital is heavy this morning so the last 15 miles of their journey will likely take them at least another half hour. Friday Jan. 20, 2017, 9:15 p.m. Follow VPR's Rebecca Sananes for the latest from their journey. This post will be updated throughout the day with highlights from both the Montpelier and Washington D.C. events. For a few hours on Saturday afternoon, Vermont's capital was a sea of pink. 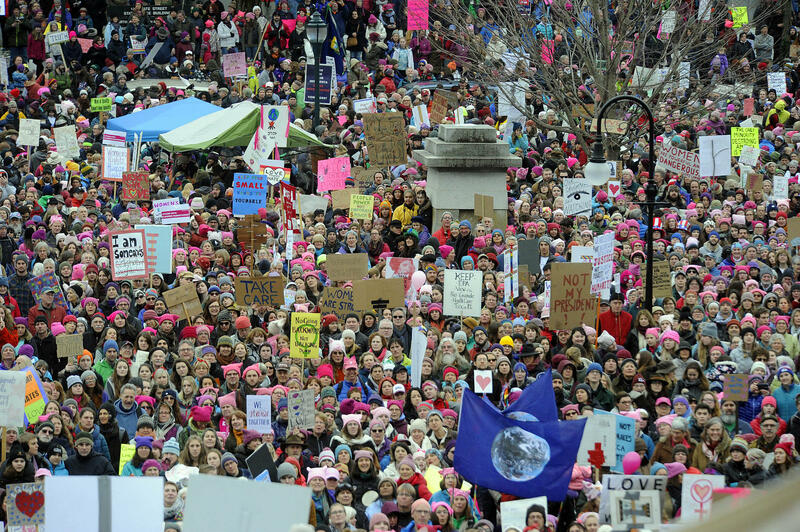 An estimated 15,000 people came out for the local Women's March, many wearing pink hats knitted especially for the occasion in a very particular shape. A group of Canadians and French nationals trying to cross into the United States to participate in the Women's March in Washington, D.C. Saturday were detained by border guards and then turned away with no explanation, according to a member of the group. In no state did Donald Trump receive a lower percentage of the popular vote than in Vermont. The new Republican president, however, still has plenty of committed supporters here — and many of them are in Washington, D.C., this week to celebrate Trump’s inauguration. Donald J. Trump has been sworn in as America's 45th president. NPR reporters have annotated Trump's inaugural address.